Polenta is one of those things that I've had a handful of times before, but always in a restaurant setting. It's never something I decided to try at home, though I knew it was a pretty basic stand-in to almost any grain in our normal at-home dinners. We do a lot of rice bowls, quinoa and couscous. 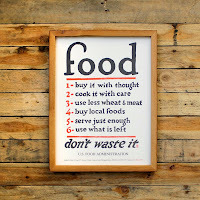 I thought, why wouldn't that work with polenta, too? Just add a little vegan butter and salt. 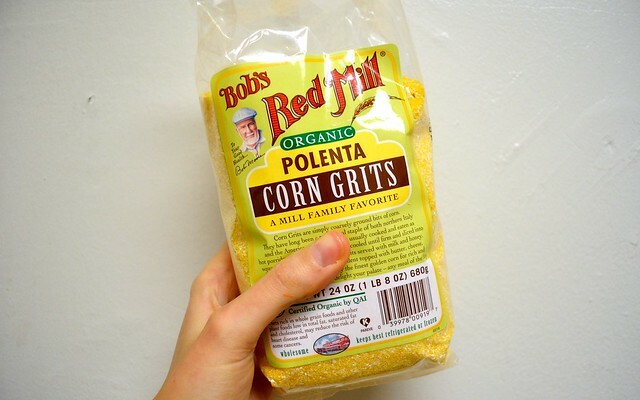 Of course, Bob pulled through again and I was able to find organic polenta on the shelf. Since polenta is a corn product, organic is important here, since corn is one of the most heavily modified foods out there. Once you have a bag of this stuff, you have a versatile (and quick) ingredient on hand for dinner or even breakfast. I've even heard you can waffle it - you can count on me trying that out, and soon. 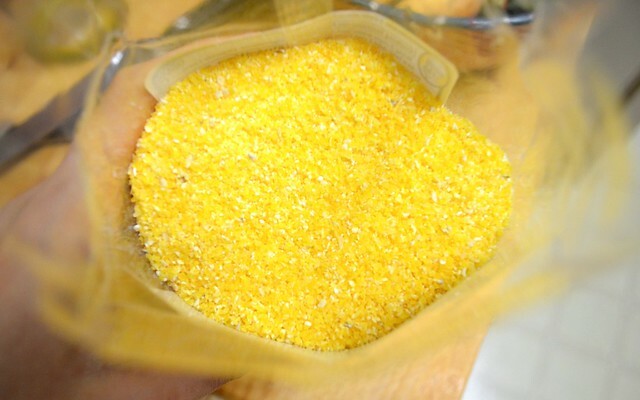 One last thing: polenta, or corn grits, are of Italian origin. You're probably thinking, well, yeah, but me, I didn't know that. 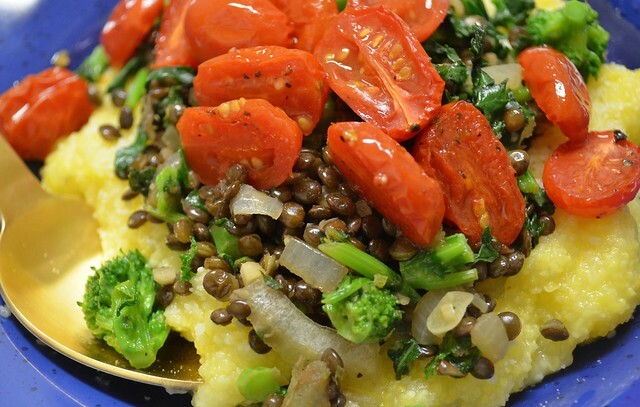 So when wondering what to put on top of this savory porridge, naturally I couldn't do without roasted tomatoes, some bitter greens and black lentils. Begin by getting your tomatoes in the oven. Preheat your oven to 400 degrees. 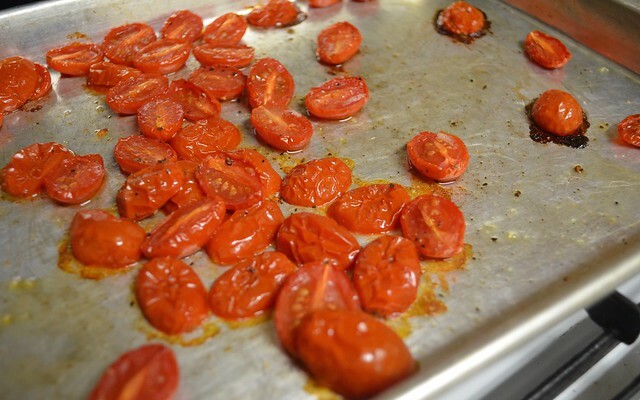 Toss your halved tomatoes in a light coating of olive oil, salt and pepper and place halves face down on a small baking sheet. Transfer to the oven for about 20 minutes. In the meantime, chop your greens, onions and garlic. In a large pan over medium heat, add some olive oil. Add the garlic and sauté for about one minute. Add your onion and sauté for a minute or two more. 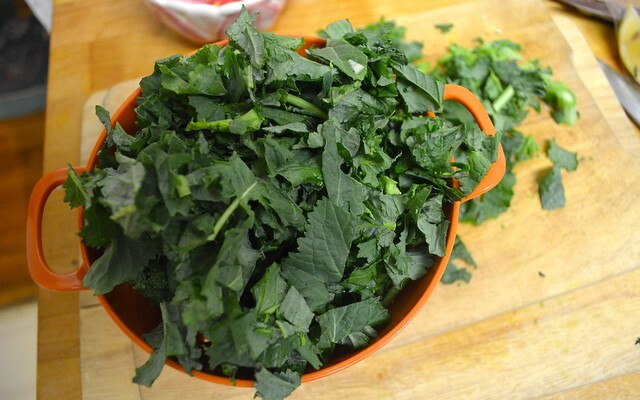 Add your greens and wilt down, adding salt, pepper and red pepper (if desired) to taste. At the same time, get your polenta going according to the package instructions which will more or less be: this stuff cooks really fast. It takes about 5 minutes once it gets going (and only about 5 before that) so plan accordingly because once it "sets" it gets a little bit harder to serve and eat. 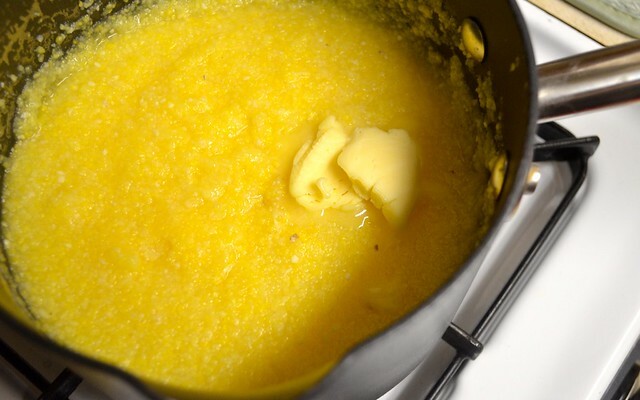 Once the polenta has thickened, add in some salt, pepper and a generous tablespoon or two of butter or margarine. 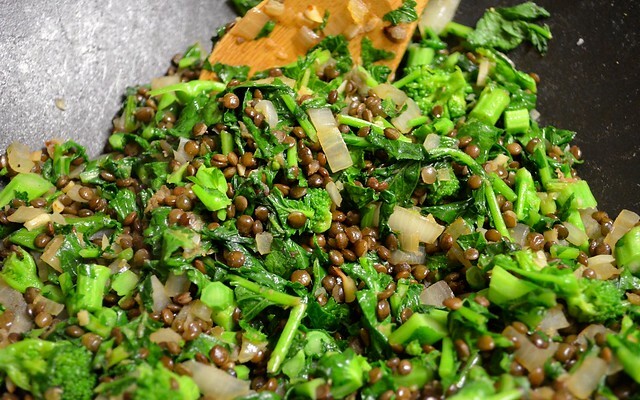 In the last minute, toss your previous prepared lentils in with your wilting greens to heat through. Finish off with the juice of half a lemon and a final pinch of salt. 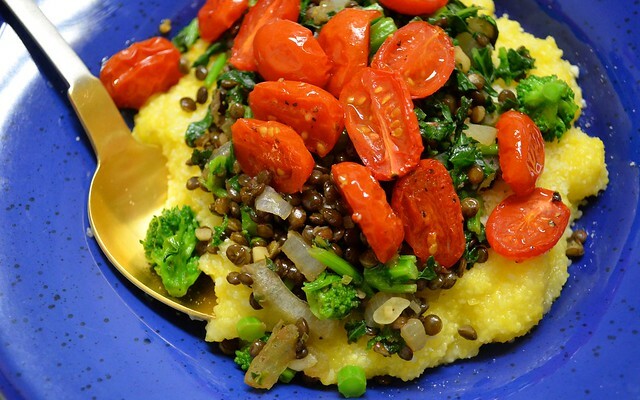 Serve in shallow bowls by making a pool of polenta and topping with greens/lentils and adding a few roasted tomatoes on top. This is a simple but satisfying dinner (even more so if you sprinkle a little Parmesan cheese in your polenta, shh). This version of polenta can only be described as hearty. You will not want for seconds. Well, you will want, but I dare you to find the room.